Now accepting payment from all major credit cards. 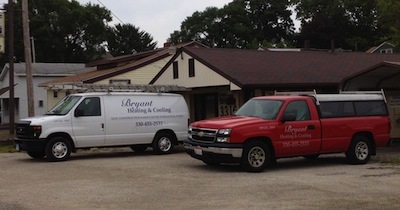 Bryant Heating and Cooling was founded in 1969 by Donald P. Bryant, after returning his return from the Korean War as a Paratropper. He devoted his life to the HVAC industry: Servicing, Installing, and recharging all your heating and air conditioning needs across Stark County, Ohio! Don passed away on March 25, 2013 and will be missed. John Regopoulos have been working side-by-side with his grandfather for the past 16 years. He graduated from Akron University with a dual degree of Business Management and Marketing. From there, he attended Stark State where he received a certification in HVAC, while continuing to serve customers alongside his grandfather.